A lot of my work is done just as above: Time + Paper + Blades. 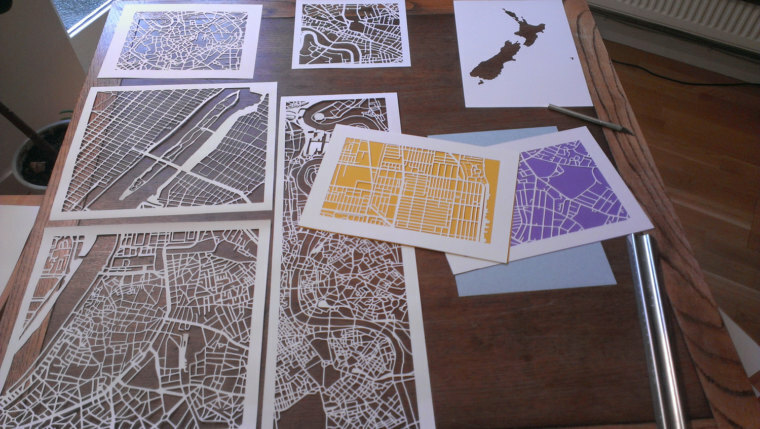 I never expected to find myself making art, but I once made a little map to touch the heart of someone close to me, and in the end I found something I had not expected, a way to express my love of cities and landscapes and to excite other people too. The first map cut I made was of Shanghai. It was a Christmas gift for a man I admired—a simple and beautiful reminder of the months he spent with a best friend in a far away place. It was not a place I had ever been, and only after some very subtle inquiries on my part did I find out which part of the city was the right one to cut. After a lot of trial and error, 3 weeks, a box of no 11 blades, and a piece of orange paper, I succeeded in creating something that was much more than I expected. The circulatory system of any city is its roads. North American cities tend towards a new growth approach: scaffolded along broad, quadrilateral corridors. European and Asian cities are an older variety of animal, gnarled, inconsistent, and quixotic. When drawing a map the edges of a city are often the most difficult—where land and road merge alongside water. 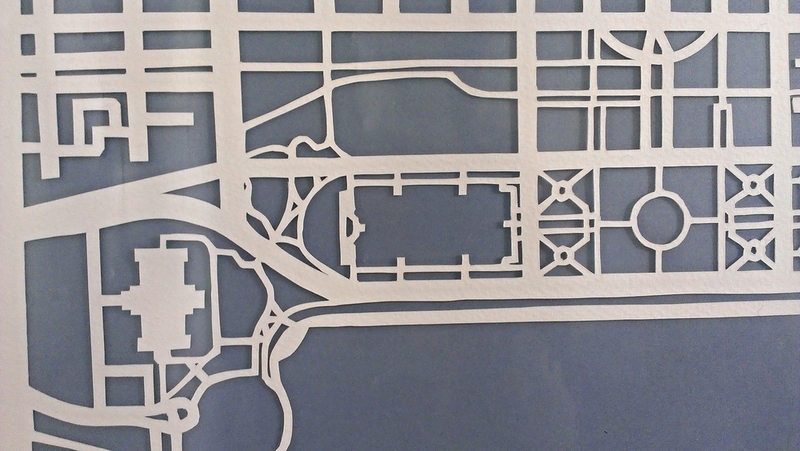 Certain functions of paper cutting and maps plague me when making a design. How do I best represent what's on the ground through paper? Positive or negative space? color or no color? Each city reflects the history of its people. London is like tiny cobwebs strung along large tributaries; little circuses all connected through radii. In New York City, Roosevelt Island seems temporarily docked in the east river; its bridges giant gangplanks onto the shore. While in Antwerp, you can sense its former glory as an economic power-house, grand and robust, yet without a single bridge across the Scheldt. People, the past and present are all bound up in a city's roads and topography. The methods I use to paper-cut keep evolving as I find new tools and better techniques to cut out the shapes I want. The balance between negative and positive space is essential to how a piece looks. I aim for evocative cuts: tiny precise details of walking paths, a recognizable curve in a much-driven road, and always seeking to make even people who know the city ask "where is that?" Much of the work is exactly as you'd anticipate: draw it out, then cut it out. I draw out my designs on paper backwards in pencil such that the drawing is on the back side of the work; all cities have a seemy messy underbelly, mine included. My work often makes use of a die-cutter, swivel knife, Swann Morton scalpel, blades, graphite, rulers of various sizes, and lots of flat table space. "Fabulous hand cut silhouette, beautifully crafted and worth every penny. Kip was very patient with my many emailed questions and it arrived perfectly packaged within two days. I wholeheartedly recommend Kartegraphik." "Thrilled with this purchase! Such attention to detail and a unique gift for my brother who lives in Brooklyn and spends a lot of time in Manhattan. Great communication and timely shipping. Thanks so much!" "Best buy on Etsy... I ordered 4 pictures to depict our favorite locations on our European honeymoon, for our 1 year paper anniversary. Kip was very enthusiastic and eager to make the exact images I wanted. Kip was very professional and a pleasure to work with. The images are beautiful and gave us a special, unique way to remember such an amazing trip. Thank you Kip for a great experience and a wonderful memento to remember for the rest of our lives! You're amazing!"